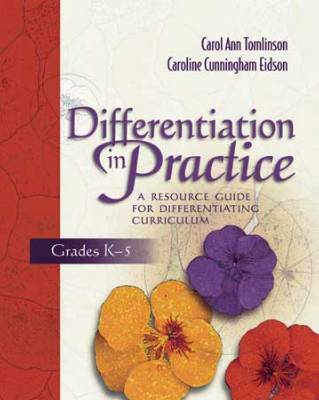 This book is the first in a new series from Carol Ann Tomlinson and Caroline Cunningham Eidson exploring how real teachers incorporate differentiation principles and strategies throughout an entire instructional unit. Annotated lesson plans for differentiated units in social studies, language arts, science, mathematics, and world/foreign language. Samples of differentiated worksheets, product assignments, rubrics, and homework handouts. An overview of the essential elements of differentiated instruction and guidelines for using the book as a learning tool. An extended glossary and recommended readings for further exploration of key ideas and strategies. Each unit highlights underlying standards, delineates learning goals, and takes you step by step through the instructional process. Unit developers provide running commentary on their use of flexible grouping and pacing, tiered assignments and assessments, negotiated criteria, and numerous other strategies. The models and insight presented will inform your own differentiation efforts and help you meet the challenge of mixed-ability classrooms with academically responsive curriculum appropriate for all learners. CAROL ANN TOMLINSON, Ed.D, is Professor of Educational Leadership, Foundations, and Policy at the University of Virginia and was a public school teacher for 21 years. In 1974, she was Virginia's Teacher of the Year. During Carol's time in public school, she taught in many differentiated classrooms and directed district-level programs for struggling and advanced learners. Today, as co-director of the University of Virginia Summer Institute on Academic Diversity, she works with an international community of educators committed to academically responsive classrooms. CAROLINE CUNNINGHAM EIDSON, Ph.D, is Director of Curriculum and Instruction at Triangle Day School in Durham, North Carolina, and an educational consultant focusing on curriculum development, curriculum differentiation, and the needs of advanced learners.